Reyn Mukai was born and raised in Hilo, Hawaii. 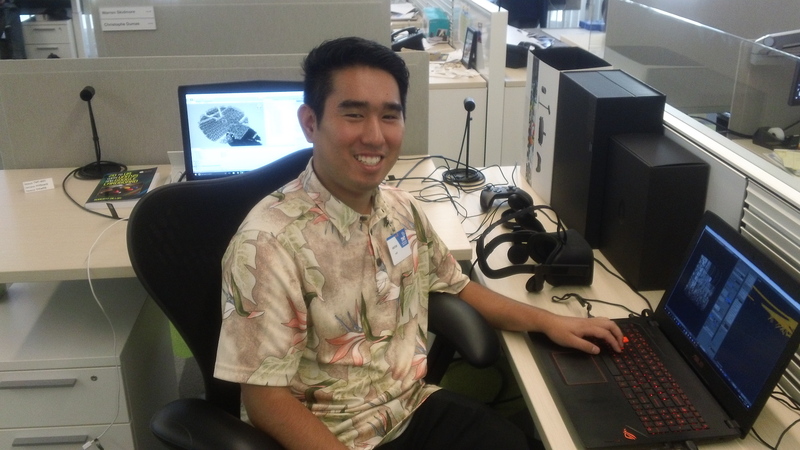 He graduated in 2014 from Waiakea High School, is an Eagle Scout, and currently a junior pursuing a Bachelor’s Degree in Computer Engineering at the University of Hawaii at Manoa. At the UH, he is involved in the Electrical Engineering Student Advisory Board, UH Drone Technologies, UH Smart Campus Energy Lab, and is Co-chairperson for the 2017 IEEE Conference STEM Program. After graduation, he hopes to pursue a career in software development or smart device development. Outside of school, he enjoys playing video games, working on electronics projects, and playing airsoft with friends. With the growing adoption of virtual reality (VR) as an immersive media experience, TMT decided to develop a VR application for risk analysis and outreach. Because TMT’s telescope facilities are still in the development/construction phase, it is difficult for safety personnel to simulate evacuation procedures and for TMT to showcase the telescope model. To address these problems, M3 Engineering developed a VR application that uses 3rd party proprietary software which restricts any kind of modifications. To address these concerns, we developed a VR application using the game engine Unity. The models for the application used the actual 3D design models of the observatory. High quality 3D CAD models, however, do not transition well to real-time, performance-focused VR applications. To make the models more VR friendly, we developed workflow between the source model and the game engine. Various optimizations were explored such as precomputed lighting polygon simplification. Numerous algorithms for simplification were explored, each yielding different reduction percentages and visual distortions. Due to the large scale of the project, not all aspects of the workflow were fully explored or tested. For example, one of the programs used in the optimization workflow for 3D models has limited format support and simplifies object hierarchy arbitrarily. While the performance impact of the simplifications was significant, arbitrary object hierarchy simplification can be detrimental when animating game features. Most of the basic project requirements were met. These include viewing the 3D model of the telescope, fly and walk player modes, and VR headset support. Additional features such as player interaction with the game world can be implemented in the future.